The Race To The Stones, a big highlight for 2016, was no exception. This was a 100 km Ultra Marathon along the Ridgeway ending at the stone circle in Avebury. Within 2 days, just as my legs were getting back to normal, I was already planning how to complete the remaining 40 km. My first thought was to do it as a single near marathon-distance run. Wanting to take in more of the countryside and do it with my wife Timea, I broke it up into a series of 5 walks of between 5 and 7 miles each. Each trip would be a point-to-point heading from west to east, the opposite direction of the Race To The Stones. Pleasant Chiltern market towns are well spaced out along the route making each a self-contained, easily accessible walk. Avebury is a special place. It's the largest stone circle in Europe, a National Trust Property, A UNESCO World Heritage Site and a Scheduled Ancient Monument. It’s also the finish line for the Race To The Stones. Last time I was here I'd had my photo taken next to the standing stones before completing the final 2 miles to the end. It was 01:30 on Sunday morning and I'd been moving for over 17 hours so I wasn't in a good place to appreciate Avebury. The other annoying thing was that Avebury isn't the same end of the Ridgeway. It's at Overton Hill, a mile and a half south of the village. I had to go back. So, on a sunny September day, my Ultra Marathon support crew (wife and mother) and I headed back to Avebury. We had a guided tour of the village from the National Trust volunteer and the obligatory photo by the standing stones. Then it was down to business .... the final stretch. From the standing stones, I followed the route of the Ultra back up the hill away from Avebury to connect again with the Ridgeway. From here I took a right turn, heading south, reaching the A4 a mile later. As a destination point, Overton Hill is highly underwhelming. There's a field on the other side of the road with an information board about the Sanctuary, a wooden circle now long gone. The most important part of my trip was the National Trail sign marking the start of the Ridgeway. The sign points to Ivinghoe Beacon, 139km / 87 miles away. Start: Parking spot at junction of The Ridgeway and Hill Road, Lewknor. At 3.5 miles and dead-straight, the first section is a nice warm-up for the rest of the trip. We used the parking space at the intersection of the Ridgeway and Hill Road. This is the closest accessible point to Field Farm, the starting point for Race To The Stones. From here we headed north-east, soon passing under the M40 where it heads north after the Stokenchurch Gap. Nearing Chinnor you can see the Chinnor and Princes Risborough Railway. Once part of the national rail network, it closed in 1989 after which it converted into a privately run heritage line. The railway centre is off Hill Road, less than half a mile north of the parking spot at the end of this section of the Ridgeway. From the parking spot the route continues north-east for a mile before taking a sharp right. The next 2 miles are a steady climb towards Saunderton Lee before a steeper descent to Princes Risborough Golf Course. A top tip for a pleasant post-walk rest, coffee and cake is the Crepe Escape in Princes Risborough. Its about 3/4 of a mile north of the Ridgeway, but well worth a detour. This was the longest and most enjoyable section section of the walk for us. The route meanders between Princes Risborough and Wendover offering some nice panoramas along the way. Highlights of this section include viewpoints at Brush Hill and Whiteleaf Cross, the Chequers Estate and Bacombe Hill. At the top of Coombe Hill the route takes a sharp right at the Boer War Monument, the highest point on the eastern Ridgeway. From here the route descends quickly to Wendover. The finish point for this section is the Shoulder of Mutton pub which was coincidentally the start point of my first Ultra, the Country to Capital. 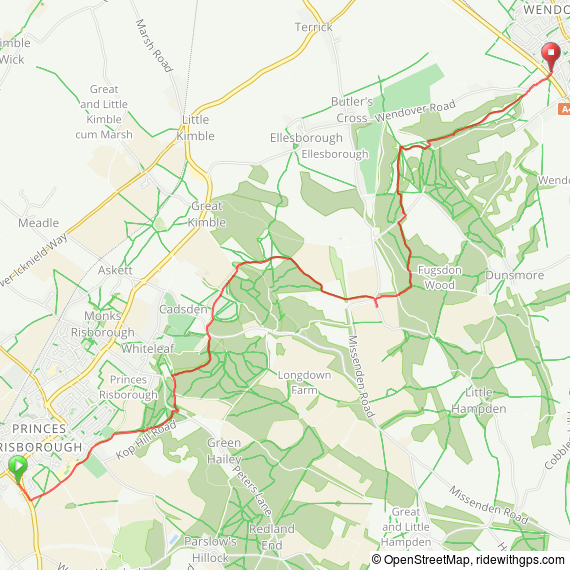 Although not as diverse as other sections, the route from Wendover to Hastoe is still a nice walk. We did this part in mid-November and were rewarded by some amazing Autumn colours. The Ridgeway holds back some of its best views for the final section. We tackled this in on a cold, crisp early December afternoon with some clear skys. Just outside of Hastoe, the route follows the top of Tring Park. This was orignally the garden of Tring Mansion and now managed by the Woodland Trust. Its also home of Tring parkrun, one of the hilliest and most enjoyable that I've done so far. Once leaving the park the Ridgeway descents gradually, passing over the A41, the Grand Union Canal and the Chiltern Rail Line before climbing again towards Ivinghoe. Much of the rest of the route is through the Ashridge Estate, a large National Trust property with a large choice of walking routes. With more time its worth checking out other parts of the estate, including Pitstone Windmill and the Monument to the Duke of Bridgewater. The summit of Ivinghoe Beacon and the end point of the Ridgeway is marked by a Trig-point and map of the Ridgeway showing the route back to the start at Overtone Hill. The clear skys also gave us a good view across to Dunstable Downs, part of our next adventure: the Icknield way to Norfolk!